For as long as I have been blogging about missing children, my contrition for their parents has only grown worse. Generally, the outcomes are not good and a parent is usually involved. 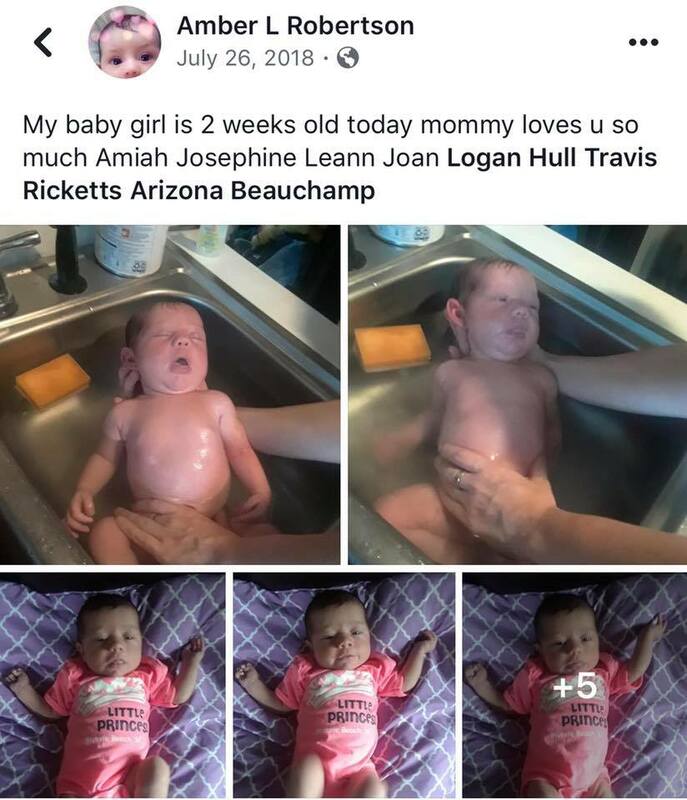 I feel no different with Amiah Robertson’s parents and caregivers. There is so much that is SO wrong with the information coming out of Indianapolis where she is from. She has been missing since last week. The dates are in conflict. One would ask why a mother or father for that matter wouldn’t be able to concisely know when they last saw their infant who can’t even walk yet. But here we are…days later and no sign of 8-month old Amiah. Police issued a statewide Silver Alert for Amiah on Tuesday after the baby’s family reported her missing this past Saturday. “I’m hoping someone can reach out to my child and get her home safely,” Amber Robertson, the baby’s mother, told Eyewitness News. Social media never disappoints when it comes to these cases. Reading and analyzing the family dynamics of the parents and those around them just brings more questions and a lot more disgust towards the adults in this baby’s life. 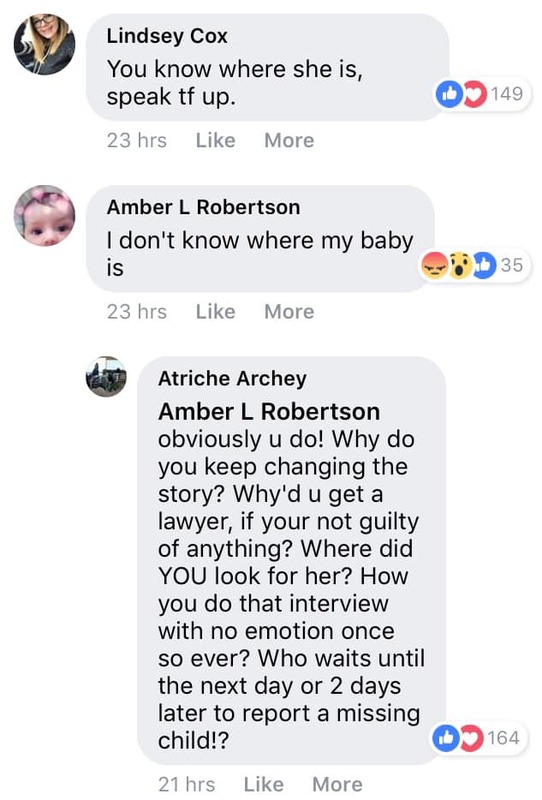 Amber, the baby’s mother, has been doing interviews and what is interesting is the fact that she is speaking in past tense about her daughter. Her comment to the media about hoping someone can reach out to her child and get her home safely. Really? Hi 8-month old who can’t even walk – how will someone reach out to her? 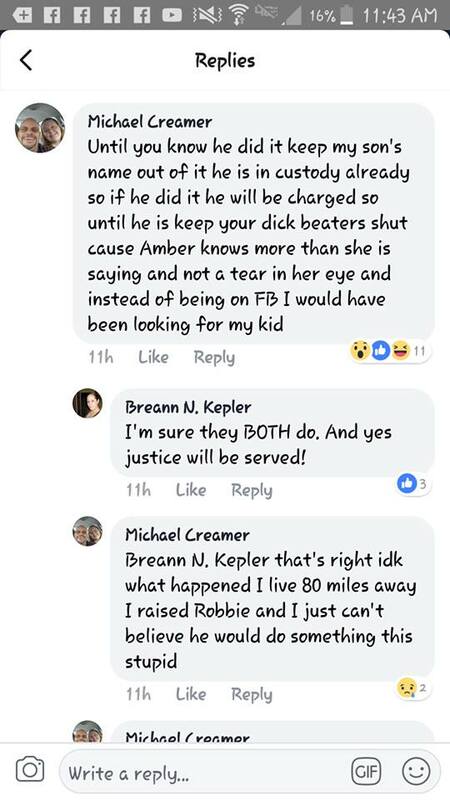 There has been discussion from the mother and her relatives about who the father of the baby is and the mother was allegedly having a secret relationship with her ex. She claims she last saw her child when she was at a Motel 6 “on a date” with Robbie Lyons. 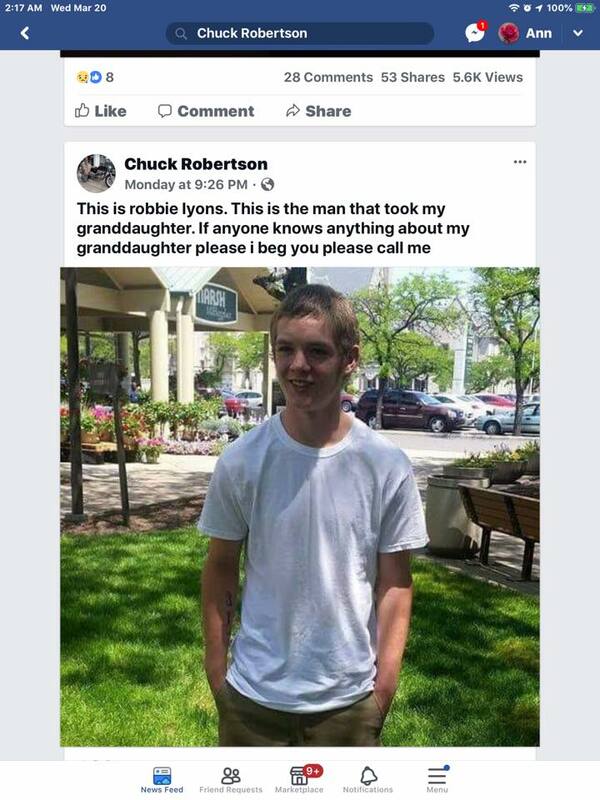 Robbie is currently in jail on a vehicular assault charge as he and Amber Robinson got into an argument the other day and he tried to run her down with his car. They all sound like such lovely people. [insert eye roll] At the end of the day while all of these adults are sucking up oxygen, there is a baby that is missing and who is likely dead at the hands of one of them. As of this afternoon, the FBI has now joined the search for the truth in what happened to this infant. While I hope for the best, I think we all know exactly how this is going to end. It is pretty clear that this so called mother killed her child. I still pray she is found safe but we all now how this will turn out. Only adults can transport an 8 month old who can’t walk. An adult knows what happened. 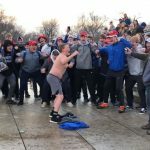 The adults are lying and mom lawyered up. 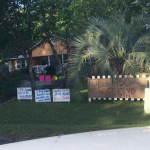 Points to mom killed child, moms family trying to be in denial, blaming boyfriend. Don’t let this girl get away with this! !